BETT is one of the two largest ICT education shows in the world (along with ISTE). It is held in London every year in January and is preceded by the World Education Forum where over a hundred Ministers of Education from countries across the world get together. BETT is held at the Excel Docklands exhibition halls. It has two DLR stations (part of the London underground network) which gives you some sort of idea about the size of the complex. Make sure you use Customs House or you may be adding a 3 mile walk to your day. I tend to stay at hotels along the DLR line so there’s no changing lines and so this year stayed in Whitechapel – normally I stay in Limehouse. What to do when you get there…. BETT is large (but getting smaller?). Comfortable footwear is essential. Delegates walk miles on a carpeted concrete floor. My biggest mistake is carrying my bags around instead of using the cloakroom – £1 an item may seem a lot – but the reduction in weight can be a bit of a lifesaver. Food and drink is expensive (£8 for a sandwich, £2 for a cold drink) but not break the bank expensive. A bit of a secret is that there are toilets located on the gallery/platinum lounge at the back upstairs every 50 metres. There are about 200 exhibitors scattered randomly around a huge hallway. One of my biggest issues with BETT is the layout. There is no order. Want some coding software for your class? Then be prepared to walk up and down the entire hall. Want a firewall for your school network? Then if you haven’t planned your route in detail and not got distracted by the DeLorean, you have little to no chance at finding half the suppliers. Even worse some gems of products were really well hidden and hard to find. Education suppliers pay something like £500+VAT per square metre, then hundreds for electric and hundreds for internet. So they make every square metre count. That means the biggest most impactful displays with flashing lights and lots of branded reps.
What was there in 2019? This year there was a notable drop on VR headsets – last year they were absolutely everywhere, a drop in software and a lack of book publishers – I didn’t see Hodder, Cambridge, Oxford, or McMillan. There was a mix of school radios, network safety, latops, LCD whiteboards, 3d printers, tablet covers, scanners, loads of robots & related coding programs…. Most stands promised to “reduce teacher workload” and to “save schools money”. Not really sure how some intended to do this. 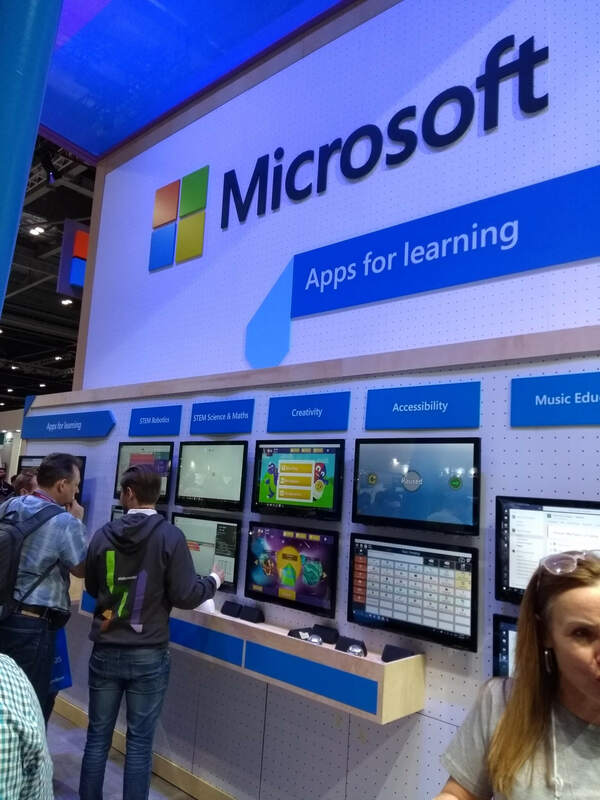 Emile was featured on a few stands – most notably Microsoft’s! The BETT Futures seemed to have a lot fewer stands that in previous years where there was a fantastic range of new innovative solutions. Microsoft and Google took their usual dominating stands. The biggest growth this year seemed to be in large stands by countries. I spotted stands for Denmark, UAE, Jordan, France, Israel, Egypt, Northern Ireland, Moscow, and Korea. Talk wise I really enjoyed Anthony Horowitz and Cressida Cowell discussions on letting children just write. No marking, not worrying about grammar or spelling just practising the art of storytelling and letting their imaginations run wild! There is always one talk I happen upon that I really enjoyed. This year it was on the Promethean stand and was by Mr Holden – headteacher of Tottington Primary School in Bury. It was the basics of organisation leadership and implemented in an inspiring way within a primary school. From some of the videos shown, it was clear that Tottington is a wonderful & supportive place to work. Being both a woodworker and a beginner Ukulele player, when I found Chord Hero I was in heaven. Chord Hero sell Ukuleles for children to assemble, decorate and learn to play. I think this is an awesome way for children to fall in love with an instrument that is easy to use and have some ownership over the project. I will certainly be buying a set for my daughter when she is a little older.